There is no one method for all slab edge formwork, it's a question of suiting available materials to the job. edge formwork - Shutters to the edge of a suspended slab. 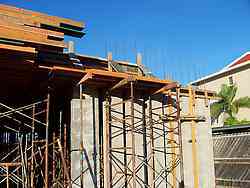 The edge formwork is fixed to the slab form sheets or the beam sheets run wider than necessary to fix the edge forms to. In the photo above note the cleats nailed to the deck ply to stop the bottom kicking out, and the cleats on the top of the shutters at the corners, hold one to the other.. 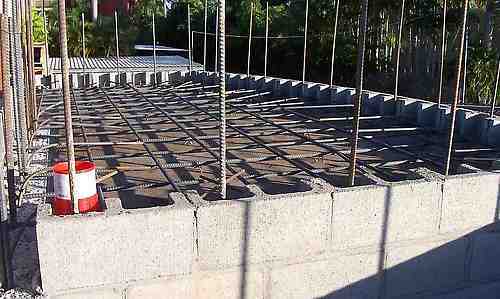 Concrete formwork - Edge of a suspended slab from underneath. slab edge formwork - edge support. At the right you can see a couple of V-Shore frames on the outside of the block wall to support the edge form. This is an easy way to do it if you have plenty V-shore on site, and more to the point if you have the room. Where the depth of the concrete is less, another way of holding the edges is a bit easier. The shutters are held up with timbers to the ground. They are held tight into the wall by tie wire that is tied around the vertical reinforcing bars that are already concreted into the block walls. Edge support bolted to the wall it is sitting on. 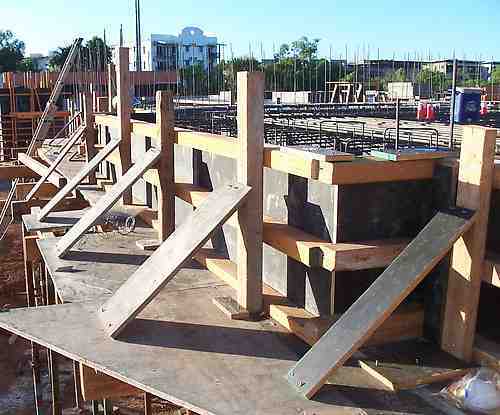 slab edge formwork - Using form bolts through a wall to clamp edge forms tight to wall. A far more positive and strong way of forming an edge to a slab that is sitting on a wall is in the sketch below. If the wall is blockwork as in the sketch, then holes are drilled and bolts are used to pull the forms tightly to the wall. If it is a previously poured concrete wall, you then use the same bolt holes that were used in the wall pour. slab edge formwork - Modular blockwork, 200 series "E" blocks. Just a quick note here. 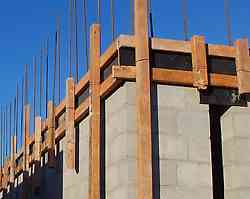 Hollow concrete walls have almost no strength before the concrete corefill has been placed. On all but the most trivial of jobs, the corefill goes in first. Providing a solid base for further work. Don't be tempted to save on concrete pump hire by pouring the walls and slab in one session. The concrete mix is different for the walls and the slab. The forces involved in clamping the edge forms and even just the forming of the decks can easily dislodge blocks.